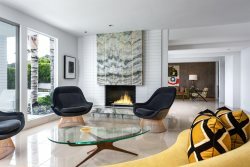 This Barry Berkus designed Mid-Century home is located in the extremely desirable Old Las Palmas neighborhood. This semi-detached residence is just one block off Palm Canyon Drive and is a short walk from some of the best restaurants and entertainment that Palm Springs has to offer. This home has been carefully decorated for comfort while still maintaining the Mid-Century period aesthetic. The bright and generously proportioned great room leads to a secluded and private deck with views of the neighboring mountains. Adjacent to the well-appointed kitchen is the dining area and breakfast bar. As you progress further into the home you will find a comfortable conversation area and media lounge. The master bedroom is complete with a queen bed, ample storage, and a beautifully renovated bath. The two guest bedrooms share a bath and also are outfitted with queen beds. This home is adjacent to the large, heated pool perfect for enjoying the Palm Springs outdoor lifestyle. Our host met us at this beautiful home. We had a lot of traffic so I kept him up-to-date on our arrival due to the traffic. Michael was a pleasure to work with! I highly recommend this property and Michael! This property is very contemporary and artsy, which I loved. The home was stocked with every item you could imagine. It included a very well stocked kitchen with service for 12 plus condiments that were not expired. The beds were so comfortable. Michael provided extra towels and pool towels. We were near the pool and there was no noise. The property has a very zen quality. It was an awesome get away for us. Although it was very close to all the shops and restaurants. Michael was an amazing host, helping us tremendously when we had a couple of logistical hiccups and challenges. Merito itself is perfectly located for quick, walking access to the center of town and its many shops and restaurants. The house is beautiful and clean and provides far more privacy than one would expect. Can easily accomodate 3 couples who appreciate some quiet time. Highly recommend Michael and Merito.